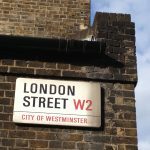 It’s been nearly four years in the making, is nearly twice as high as any other London viewpoint, and allows you to see the greatest city on earth in all its 360-degree glory. 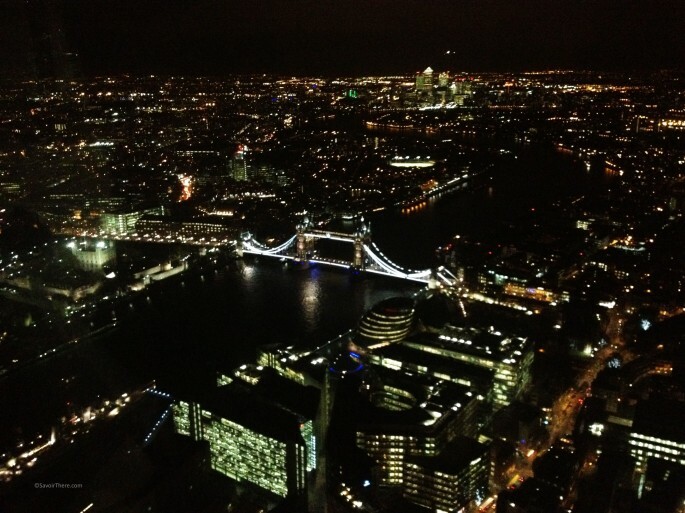 Here’s my report on The View From The Shard – plus I’ll show you the secret viewpoint that paying visitors will never get to see. 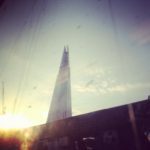 In a previous post I explained how I stalked The Shard as it was being built – and how even though there’s been mixed feelings about the building amongst Londoners, I’ve been excitedly photographing it from various angles and in various states of glassiness as it went up. And I couldn’t wait to get to the top to see the amazing view. 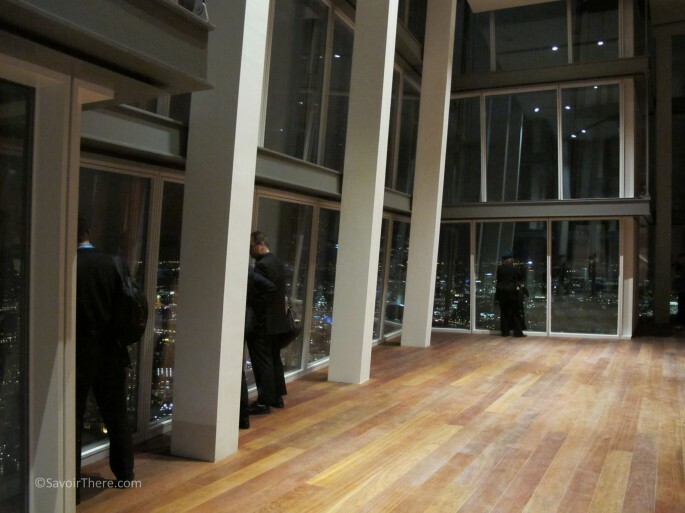 I was one of a handful of lucky people to be allowed a sneak preview of The View from The Shard before it opened to the public on February 1st 2013. On arrival at London Bridge I was shown the boards advertising the Shard inside the station, which will form the official public entrance to The View From The Shard, the viewing galleries which occupy the highest habitable floors of building. 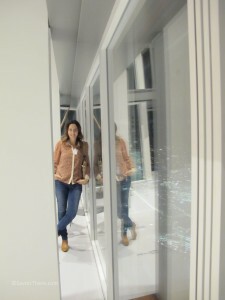 I was then led into the reception area for the Shard’s offices, and to the elevator to be whizzed up to the viewing floors. I’d expected to be donning a hard hat for the visit as the interior is still a work in progress, with contractors on site in fluro jackets. But despite the odd cable hanging out, the interiors, flooring and lighting were already in place. Like an extremely up scale episode of DIY SOS, the scene here had been quite different the day before our visit I was told. The View From The Shard begins on level 68, and it was here that I was treated to a now-secret view that no-one else in the world will ever see – the space between the lifts and the glass facade is far more narrow than on the floor above so has been concealed forever to stop people piling out of the lift and simply gawping, causing a major health and safety issue. Having enjoyed the secret view from the shard, I made my way up to level 69, which will become the main viewing gallery with completely uninterrupted 360-degree views of London, stretching 40 miles. 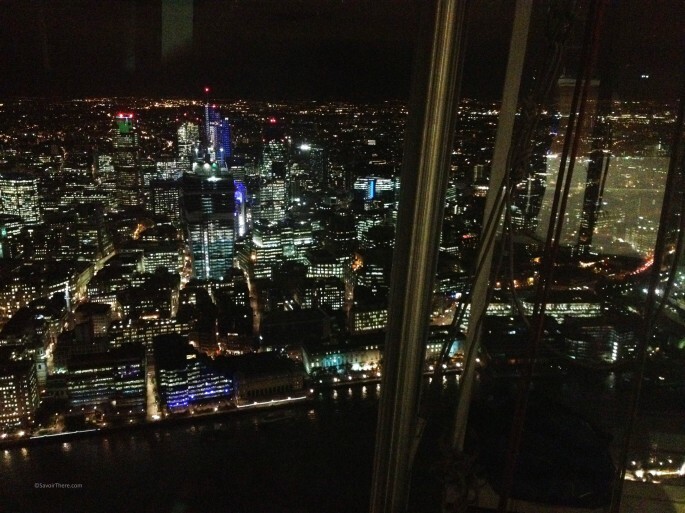 You can walk the entire way around the Shard at this level, spotting landmarks like the London Eye and the BT Tower, itself an amazing viewpoint, as well as buildings and monuments all over London, and you can take the opportunity to examine the building itself from within. I visited at night and the spectacle of my beloved city laid out before me lights twinkling was an unforgettable experience. I’d considered carefully whether a day time visit would be better, and plumped for the romance of a nocturnal city spectacle. 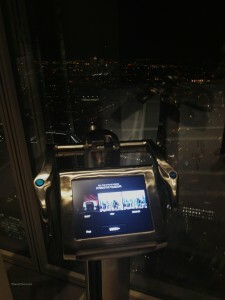 The digital telescopes provided, the first of their kind in Europe, will allow visitors to change their view from real-time to stock footage, with zoom capabilities on the 200 landmarks which are highlighted. My favourite view is the scene of classical London landmark of Tower Bridge in the foreground, as the Thames snaking off into the distance drawing your eye to the modernity to Canary Wharf in the background. This says so much about how London has evolved, and continues to grow and expand, and for me the addition of the Shard to the London skyline is a a great addition to London’s architectural evolution.